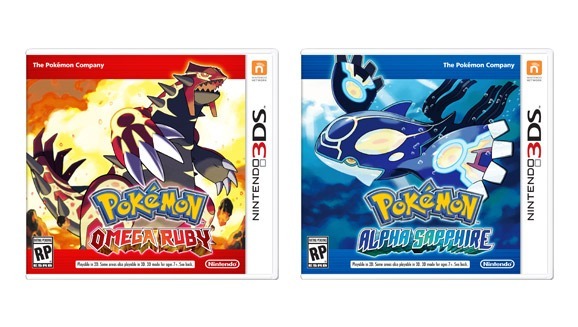 Once again we have made the great journey around the sun, another year has come and gone, and with it another set of new PokÃ©mon games. 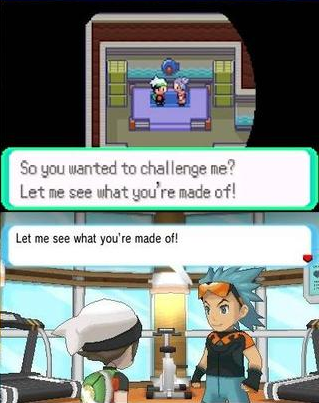 This time we’re looking at a remake of the Gen 3 PokÃ©mon Ruby and Sapphire. But how does this new generation compare to the originals? To find out we’re going to examine this image, a collection of comparisons of the original games and the remakes, and analyze each set of images to see how the game has evolved since it’s predecessor. With our first image, we have something pretty simple: just a shot of May in her room, the very first second of gameplay in fact. It’s not much, but it does give a nice first look at how well the game made the jump to 3D. 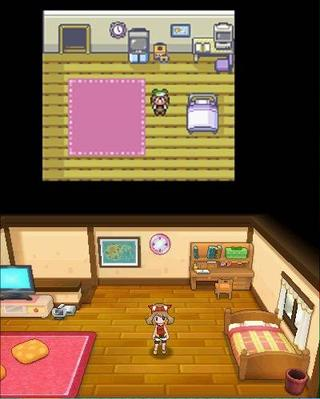 We can also see that May has changed her room up a bit and gotten a Wii U since we last saw her 10 years ago. Okay, so the jump into 3D in some ways is really great, in other ways… not so much. This is one of those moments that’s not improved by the better graphics. One good thing about having undetailed sprites is that you can use your imagination to fill in what the game can’t show. Without context a human sprite looking and a PokÃ©mon sprite facing each other really doesn’t mean anything, it could be him petting the dog, or talking to it. It was the frantic music that really set the original scene and gave it a sense of urgency and danger; after all, for all you could guess from the sprites, Professor Birch could be just barely holding that dog back as it tried to tear out his throat (at least that’s how I imagined it). Your mind could fill in the blanks with whatever you felt fit the scene. So, while the new graphics have allowed the developers to make the Professor more expressive (you can clearly see he’s scared here as opposed to before), they also take away a lot of the gravity of the scene as the Professor now just looks like he’s overreacting to being harassed by a particularly yappy neighborhood dog, rather than terrorized by a dangerous PokÃ©mon. 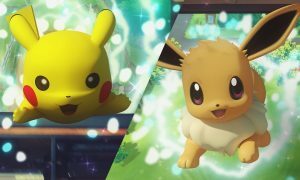 On the other hand, these two images show us how the new graphics can be used to quite good effect in allowing the characters to become more expressive. 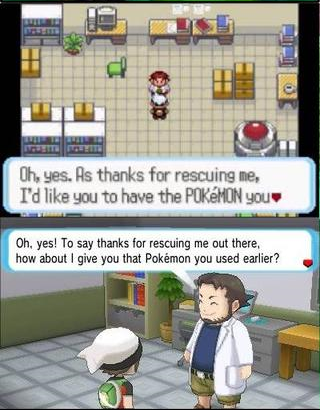 Professor Birch’s new look is certainly more memorable than his bland, unexpressive old one because of them. 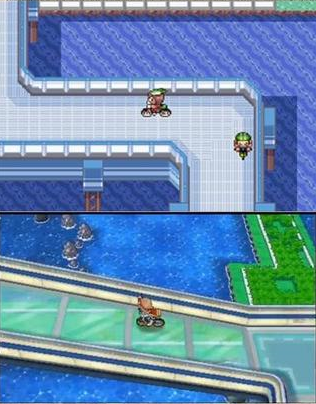 Next we have a nice shot of Oldale Town and the “helpful” tutorial guy, who will kindly drag us around town to make sure we know about both PokÃ©mon Center, PokÃ©marts and everything PokÃ©mon. 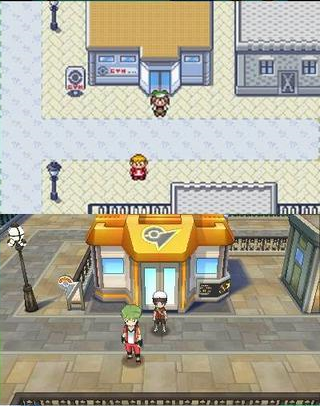 This shot itself is somewhat interesting though, as we can see some of the visual upgrades the town has gotten, along with the PokÃ©mon Center’s new look. I really love this shot. Graphically, it’s not so impressive, but the angle and seeing the Beautifly flutter across the screen, I think it just helps make the world seem so much more full and alive. It’s a great establishing shot. 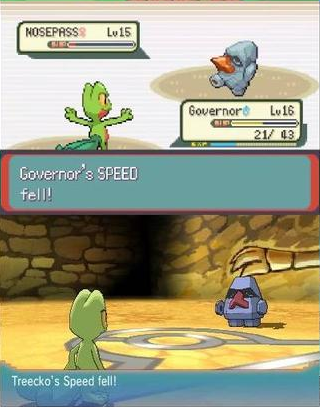 We never got a shot like that in the original, but whoever made this image seems to have pinpointed where it will take place (Route 102, just before reaching Petalburg City) pretty accurately in his comparison. 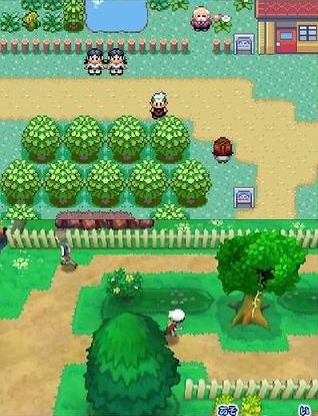 Next we have a picture of the very tip of Route 104, right before we would get to Rustboro City. Not much has changed here aside from the graphics and camera angle. Although, you can see that the puddles will be slightly larger in the remake, as in the original they were 2×2 squares while in the bottom image they appear to be 3×3. We can also see that diagonal running is back from X and Y, which is unsurprising. One last nifty detail: if you look closely at the bottom image you can see that at the time that screenshot was taken it was still a beta build. 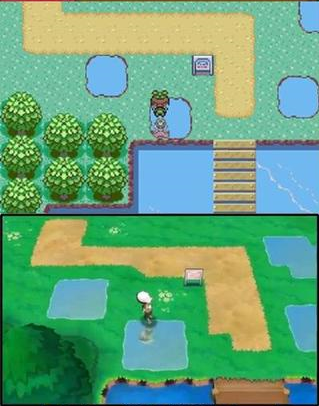 Because, in the original games when you ran across puddles like that little splashes would trail behind you. Yet, in this image Brendan is clearly running, yet there are no splashes in the puddle. Which I found kind of interesting. Here we get a good outside shot of Rustboro Gym. The Gym has got a new, distinctive look, which I like. We can also see that the city itself has gotten some new groundwork in, which is certainly nice, it gives it a much more unique feeling. Also, the dude hanging out in front of the gym changed his hair color in the last ten years, yet I feel he has not changed his jacket in that same time period. 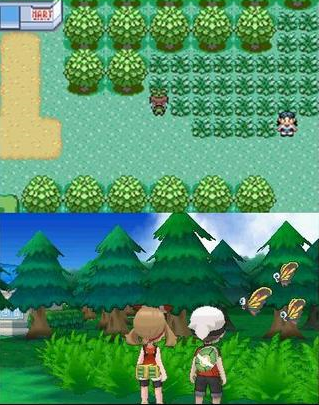 It is kind of nice how faithful the developers were to the original sprite though. Okay, so this picture has been talked about a lot, but I feel I could go over it again. 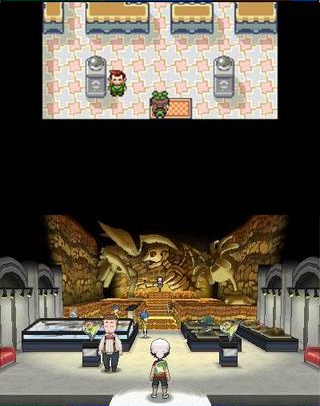 So apparently Roxanne didn’t just get the outside redone, she’s had her entire Gym remolded to look like a museum. It’s certainly a welcome change, as it was a little bland before. Also, fun fact: the statues at the very back are from left to right: Kabutops, Dragonite and Lileep. 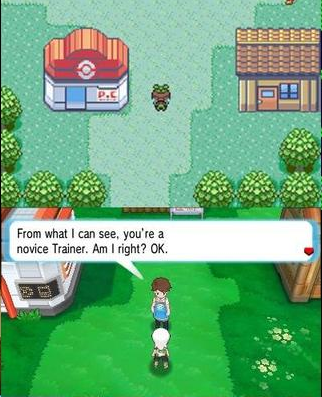 Here we see Brendan about to face Roxanne. You can see her dialogue is unchanged, but the new 3D allows us to get a nice close up. Like some of the earlier ones, this shot really shows how the upgraded graphics can allow the developers to make the characters more expressive, which I think is great. Here we have a nice shot of a PokÃ©mon battle (probably against Roxanne), nothing too interesting or new here, since it seems to be pretty similar to the battle system from X and Y. I thought it was worth putting up anyway though. 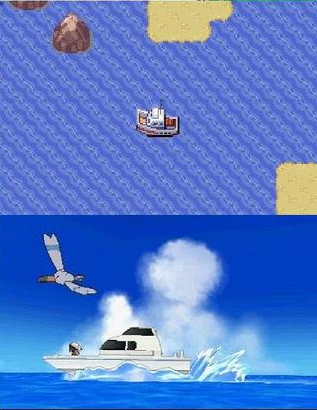 Here we have a nice shot of the player sailing to Dewford Town across Route 106, nothing too interesting. The fact that the graphics now allow for the developers to use camera angles other than just top-down is nice. It lets them get some cinematic shots like this that can really help to set the mood. On the other hand though I liked the sailing in the original because you could see the route you were sailing on, and it looked like a route. It let you build up anticipation since you knew you could come back later with Surf and check out all the things you missed the first time. It’s really a matter of personal preference though which way you prefer. 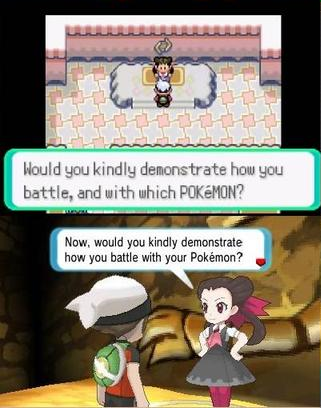 And now we get to the fight against Brawly, the Fighting type Gym Leader of Dewford Town (what a creative name he has). 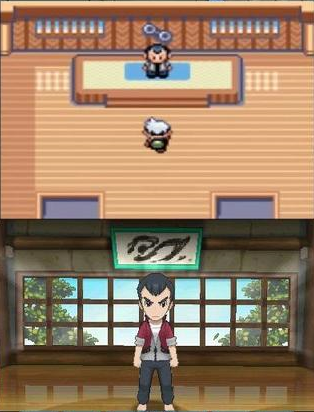 We get a nice look here of how he’s reformatted his gym over the years. He’s got from the old maze-like design, to a more interesting gym-themed design, which I feel makes more sense with his Fighting type PokÃ©mon. 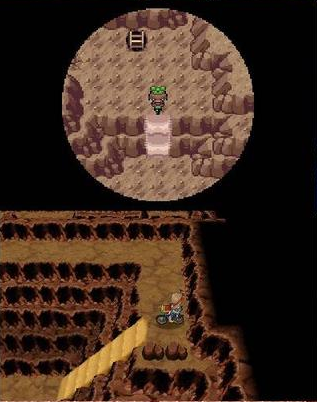 Here we have our first shots of Granite Cave. The first thing you might notice about these two images is that they’ve either altered the way Flash works, or they’ve removed the need to use it entirely. 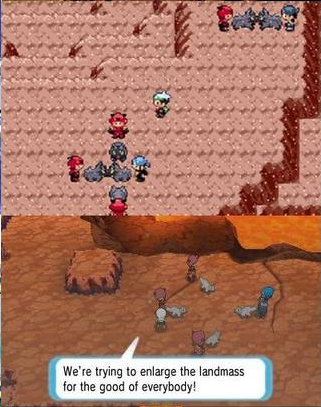 In the original Ruby and Sapphire, using flash would expand your field of view to an orb directly surrounding you, like in the top image, but it wouldn’t fully illuminate the cave like it would in Red and Blue. So, since the bottom image has no orb of vision, we can probably assume that either Flash works differently, or you won’t need it at all this time around. 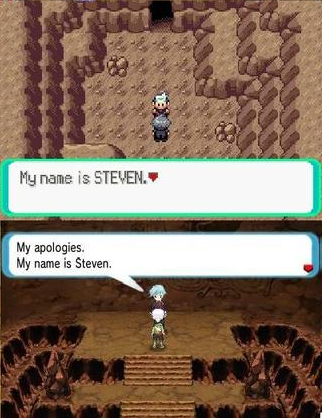 Here we have out first look at Steven. We can see that his room is a lot more… throne like this time around as he stands at the very center of the very top of a long set of stairs as opposed to the original where he just happened to be in room in a cave. 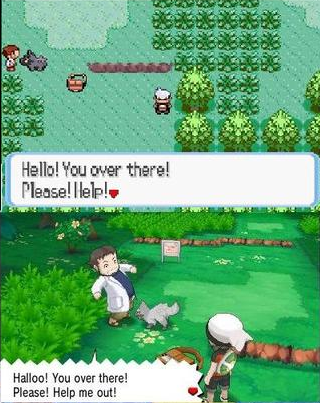 Here we have a nice shot of Route 117. 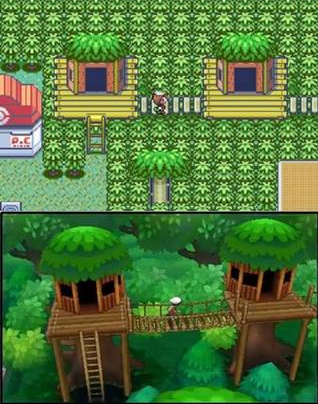 There have certainly been a lot changes on the route over they years, and it appears that you’ll be able to make a Secret Base here now as well. Here we have the Mauville City Gym. It seems to be mostly the same trap-wise: you hit the switches to turn on and off different streams of electricity to open new paths. I like the new industrial look it’s got going on though, definitely better than the gaudy old yellow tile. Here we have a shot of Cycling Road. Nothing too exciting, but I kind of like it’s new look. 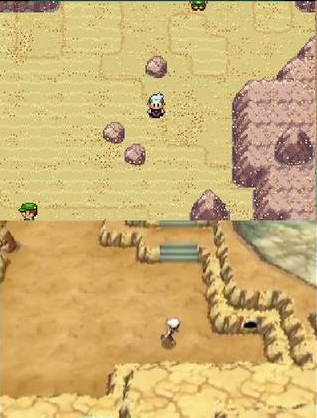 Next we have an image of Route 111, the big old desert route. It looks a lot different now, it seems they’re going for less of a “sandy desert” look and more of a “rocky desert” look. There appear to be stairs and cliff sides, which weren’t there before. 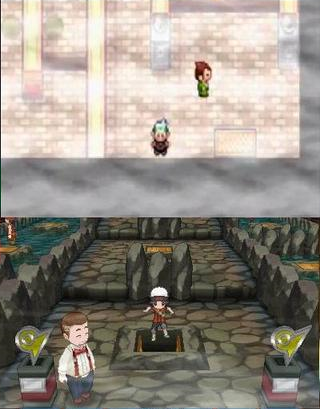 Here we have the Gym of everyone’s favorite gym leader Flannery of Lavaridge town. I think this new design better keeps the “Japanese hot spring” theme than the old one did, I really love the rocky design. It looks like it kept the same old fall traps though… which I actually found kind of annoying now that I think of it. I love this image. So, so much. 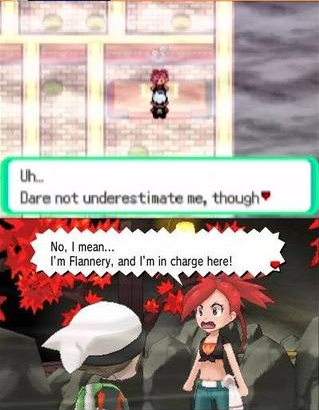 It really conveys everything about Flannery so well: she’s fairly new at her job, and doesn’t have a lot of practice or confidence yet, but at the same time she’s trying really hard to act tough. The dialogue in the original conveyed that well enough, but her expression and body language here just sells it. This is one of the great things about 3D graphics, that I feel really adds to the games. Here is an interior shot of the Petalburg City Gym. Nothing to exciting, but I like how they were able to convey the whole “dojo” theme it’s got going on even more clearly this time around. This is another one of those scenes that does not improve with better graphics. The image at the top is really simple when you look at it: it’s three red guys staring at dogs, who themselves are staring at another dog, who is also being stared at by a blue guy, as though they were all just hanging out in the world’s most hellish dog park. What’s nice about the un-detailed sprites though is that they imply a really fierce battle, as Archie manages to hold off three Team Magma grunts all on his own. You can imagine that from those sprites combined with the context. Now look at the bottom image. Once you add more detail, it once again becomes three red guys staring at dogs, who themselves are staring at a dog, who is also being stared at by a blue guy. Except now you can clearly see what’s going on, and it’s much less impressive now. When you don’t have those details you can fill in the blanks and imagine the fight that’s happening; but when you add in details but don’t change the scene to compensate, there’s no longer an implied battle, it just becomes four people and their dogs standing around. Holy crap! Tate and Liza have just completely overhauled their gym. It doesn’t even look remotely similar to what it used to be. Not that that’s a problem, it looks amazing, but still. It’s got a crazy deep void now and everything. Anyway, it looks like to get through the gym this time around you’ll have to move by going over those little dotted lines somehow. Here we have a shot of Phoebe from the Elite Four. Again, nothing too exciting, pretty much the same as every Elite Four room, but the reflections on the floor are pretty nice though. Now this image is pretty awesome. 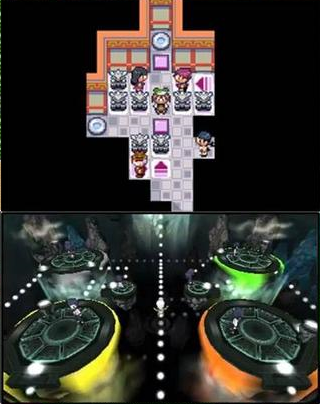 It’s been talked about before, but Secret Bases are getting quite a revamp in this game. 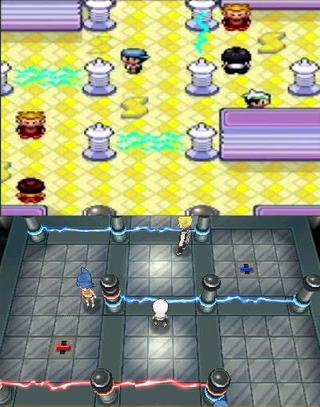 This time you’ll be be able to set them up like mini-gyms and exchange them via Streetpass. 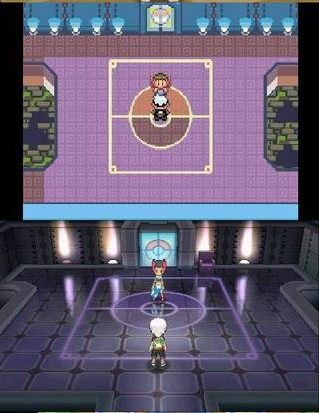 So now you can fight your friends in their own personalized gyms or set up your own gym from which they can fight you in their game! I think this is one of the most exciting features about the new game. So, how about you guys though? What did you think of these new images? Do the have you excited for the new games? Do you think you’ll be getting them?